Cancer Council NSW has awarded nearly $6 million to 15 ground-breaking cancer research projects at their annual NSW Research Awards. The grants help fund future breakthroughs in cancer research, with 15 of Australia’s leading research teams paving the way for new ways to treat the disease. Among the recipients is University of Newcastle (UON) and Calvary Mater Hospital researcher, Professor Stephen Ackland who, with his team was awarded $450,000 to improve rectal cancer treatments. 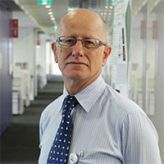 Professor Ackland and his team will be leading a project grant coordinated by the Australasian Gastro-Intestinal Trials Group at the University of Sydney which will conduct a phase 2 trial testing whether statins, a drug for high cholesterol, can improve tumour shrinkage and reduce the side effects of rectal cancer treatment. “Our community in the Hunter region has been absolutely amazing at raising funds to contribute to funding for researchers such as Prof Ackland,” said Shayne Connell, Regional Manager Cancer Council Hunter Central Coast. Rectal cancer is often treated by chemotherapy and radiation before surgery, but if the cancer responds poorly to treatment, many patients will relapse. Previous studies have suggested that people taking statin drugs have better treatment responses and fewer side effects during radiation. Statins are a class of drug used to treat high cholesterol. "The addition of a cheap, well known drug for a short period during preoperative chemo and radiation might have substantial benefits. If shown in this context, similar scenarios in other cancers could then be tested. This is "drug re-purposing" - exploring the value of old drugs in new situations,” explained Professor Ackland. Professor Ackland and Prof Michael Jameson (Waikato, NZ) are leading the SPAR trial, a randomised phase 2 trial which will test whether taking a statin for 3 months (during and after treatment) improves the response of a rectal tumour to radiation and chemotherapy. The trial will also determine whether adding statins to chemo-radiation can reduce the side effects of this treatment regimen. There will be 222 patients from Australia and New Zealand enrolled in the trial. “Professor Ackland and his team, as well as many of the research teams we have funded this year, are world leaders in their domain, and are positioned to rapidly translate their findings into practice. We look forward to seeing the results of this vital research,” continued Mr Connell. “The broad range of projects that we fund – across many types of cancers and aspects of the cancer journey – shows Cancer Council NSW’s commitment to work across every area of every cancer,” said Mr Connell. “We’d also like to thank our supporters – as an organisation that is 96 per cent community funded, these grants truly have been made possible by the community”, concluded Mr Connell.